I will be the first one to admit that I don’t know much about the Seven Years War. When I look for a book about a period that I am not familiar with, I usually buy one that will serve as a reference book on the topic – providing detail on a variety of topics, rather than an in-depth study of one particular aspect of the subject. Digby Smith’s Armies of the Seven Years War fits the bill perfectly. Armies of the Seven Years War is an encyclopedia that, as the title states, provides information on the commanders, equipment, regimental histories, uniforms of the major participants of the war and the overview of the pivotal battles. The book is divided by country and includes chapters all the major powers (Austria, France, Great Britain, Prussia, Russia, and Spain), plus the numerous Germany duchies and principalities, the Holy Roman Empire, Sweden, Saxony, and Portugal. Each chapter is organized the same way. Mr. Smith provides for each infantry and cavalry regiment, a short history (when it was raised, in some cases when it was disbanded, it’s facing colors, and when possible information on its standards), and a short discussion on the artillery. The major powers are covered in many pages, while smaller countries, such as the Duchy of Württemberg and the Bishopric of Würzburg have only five and three pages respectively. Mr. Smith closes the book with three appendices. The first covers twelve battles (both ground and naval) that had a major impact on the war. Each of the battles has a short description of the action, orders-of-battle down to regimental level, and losses for each side. There is a colored map for each of the battles discussed. One of the major problems with studying the war is that after 250 years, many of place names have changed and tracking the locations of some of the more obscure villages and towns can be difficult. Appendix Two is a gazetteer, providing the names in German and Polish, and their location. The final appendix has forty two short biographies of the key personnel of the major powers. Armies of the Seven Years Waris lavishly illustrated with an amazing 87 colored plates and maps, and over two hundred black and white pictures! Thirty-seven of the colored illustrations are uniform plates by Richard Knötel, while Mr. Smith also included the color uniform schematics of Lienhart and Humbert. Black and white illustrations cover a wide range of topics, including flags, weapons diagrams, more Knötel plates, and numerous drawings of the intricate patterns on the front of the British and Prussian grenadier caps. Overall the book is an amazing collection of facts and information and is a very valuable reference source on the war. The colored plates are worth the price alone! 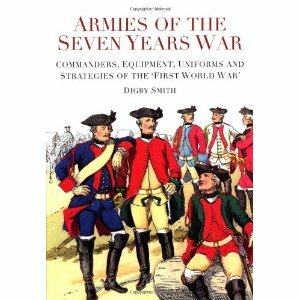 This is a great book for those who want to expand their knowledge on the Seven Years War and for the wargamer looking for information on uniforms and battles.